The Blackline cloud-hosted infrastructure and Loner Portal safety monitoring user account is the centralized home for efficient management of safety alerts and fielded Loner devices. Loner Portal ensures that managing a deployment of thousands of devices is as easy as managing ten. Loner devices are managed with configuration profiles that make it easy to tailor device operation for one or more employee roles and scenarios. Each Loner device is assigned a configuration profile and automatically inherits that configuration’s settings with Blackline’s infrastructure, seamlessly managing all real-time synchronization over-the-air. Similarly, Loner Portal’s alert profiles ensure a consistent safety alert configuration for each employee role, team, location and scenario. When Loner devices are assigned to an alert profile, the triggered safety alerts automatically notify specified address book contacts such as supervisors and team leaders. Safety monitoring personnel who own the safety alert management responsibility manage safety alerts from receipt through to resolution. Multiple alert profiles support more complex organizational structures and deployments, ensuring the correct individuals are notified. Each alert profile includes the employer’s custom-tailored emergency response protocol to ensure that all safety alerts are managed accordingly. 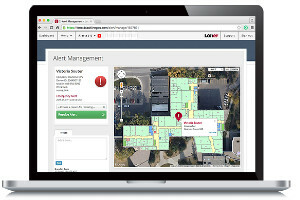 Loner Portal’s comprehensive safety alert management workflow empowers monitoring personnel with the situational awareness required to quickly respond to safety alerts, assess the situation, escalate within your organization and dispatch emergency responders—whether these are nearby co-workers or your own control centre. All Blackline safety monitoring devices and smartphone apps are support-ed by the Blackline Safety Network, our cloud-hosted infrastructure and Loner Portal monitoring account. Customizable for small businesses through to multinational enterprises. Enables management of the fastest response possible. Text and email safety alerting to supervisors and managers.